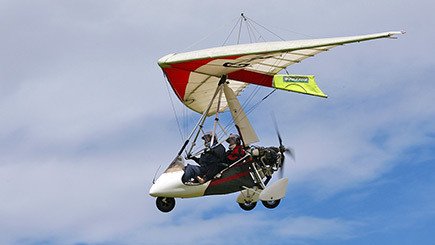 Get a unique flying experience with a microlight flight and take to the skies in a lightweight frame based on a basic hang glider. The experience begins with a safety briefing, then take off with a qualified instructor and enjoy the spectacular views of the Nottinghamshire countryside from the dual controlled, flex wing microlight. The instructor might even hand over the controls during the flight so you can see the speed and manoeuvrability of the aircraft. For anyone who wants to fly again, the flight can count as flying time towards a microlight Private Pilot's Licence. Max fully-clothed weight 15 stone. Min age 16 and under 18's must be accompanied by a guardian who'll be required to sign a disclaimer. Reasonable physical fitness is required and women in either the first or the last three months of pregnancy can't fly. Any cancellations due to weather will be re-booked. On the day of the flight, it is ESSENTIAL to call the dedicated weather line (the automated message is updated daily at 7am) on 01909 259 059 (choose option 3) to confirm go ahead. 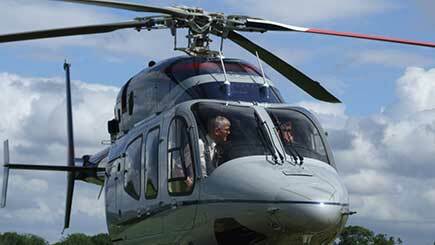 The flight will last for approximately 30 minutes, but please allow for longer at the venue. The briefing might be shared, but the flight will be held on a one-to-one basis with a qualified microlight flight instructor. Most microlights have open cockpits, so wrap up warm. Wear sensible shoes (no heels) and gloves. Sunglasses are recommended all year round. Flying time can count towards a microlight Private Pilot's Licence, for which 15 hours of dual control and 10 hours solo flying is needed to qualify. Please be aware that this is quite a high adrenaline experience, not for the faint hearted.